This International Encyclopedia of Migration will define and explicate terms, concepts and key topics with widespread usage and recurring relevance for learning about and developing the fields of both international and internal migration. With migration being partly defined in the modern era by law and public policy, the subject includes knowledge not only from these areas but also from a full array of academic disciplines. Hence, this encyclopedia will include material from such fields as anthropology, archaeology, criminology, demography, economics, education, ethnic studies, geography, health sciences, history, law, linguistics, public policy, political science, psychology and sociology. 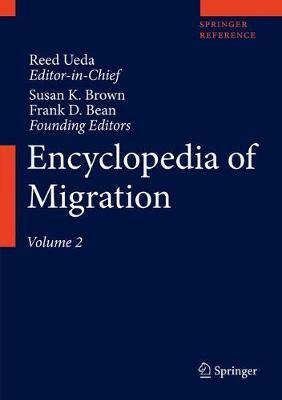 As migration has been such an important part of the peopling of all parts of the world, this encyclopedia will also include synopses of major geographic movements from ancient and early history. The International Encyclopedia of Migration will be a significant resource for students, teachers, practitioners, scholars and researchers interested in or working on any aspect of migration in any field. It should be particularly useful for people seeking information and knowledge about migration from fields other than their own.